Do you remember my recently finished Belfast Hoodie by Carrie Bostick Hoge for Quince & Co.? 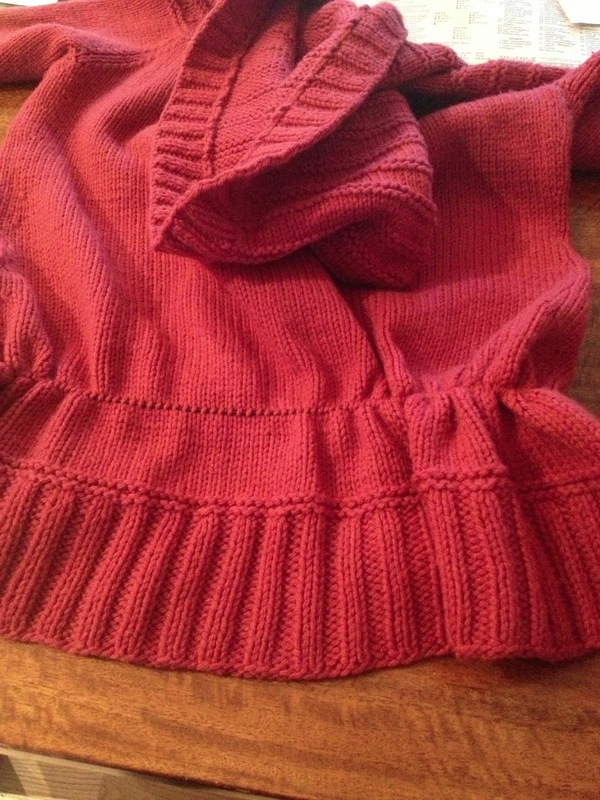 I knit this in Quince & Co. Lark in the Pomegranate colorway. I love everything about this cardigan, the hood, the trim, the fitted sleeves, the raglan/yoke combination, the pockets, the buttons, etc. You get the idea, it is wonderful. The only thing I didn't love on me is the length. 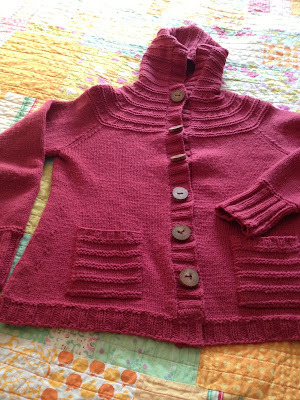 The pattern is wonderful, the design is cozy and fun. Length is something that you can change and modify on any garment you are knitting. At first I thought the length was perfect but I had modified the pattern and put buttons and buttonholes all the way down the fronts. 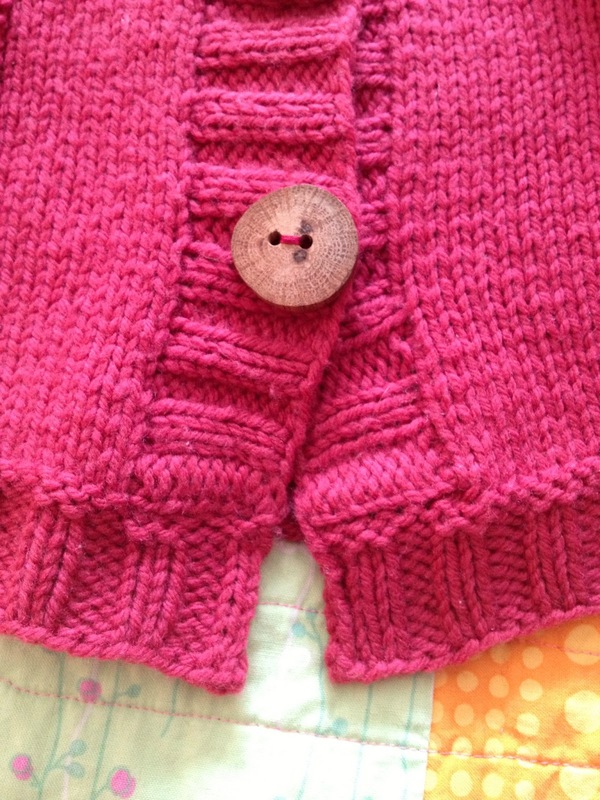 The pattern is intended to be a swingy, open A-line cardigan with three buttons at the top only. The way I wanted to wear it was all buttoned up. The loose A-line shape and my buttoned up fronts didn't mesh well. The cardigan was too loose at the bottom and there was simply way too much fabric to wear it buttoned up all the way. It didn't sit right. I stewed around in my thoughts on the extra-length and extra-width at the bottom for awhile. In the end I decided it was simply too long for me to wear comfortably (you can see the length in the photo above). The cardigan came all the way down to the top of my legs plus some. In the photo above you can see how long the cardigan is beneath the pockets. I basically wanted to remove everything below the pockets and add on a short ribbed edging. The cardigan is knit from the bottom up with the button bands picked up along the edges and added on after the body is complete. That presented an issue with pulling out the bottom and making it shorter. 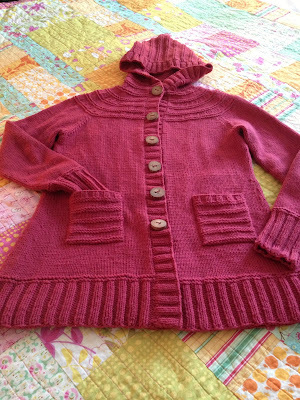 The photo above shows the cardigan after I picked up hundreds of stitches along the fronts and hood. I could not envision pulling out these stitches that circled both fronts and the hood. It was around 350 stitches plus more that I had picked up for the front bands. I had to think of another way to shorten my Belfast Hoodie. I had plenty of leftover yarn, almost an entire skein, after knitting the cardigan, plus 2 extra skeins still in my stash. Yarn was not a worry. I tried it on and decided that I needed to remove all of the fabric from about an inch under the pockets to the bottom edge of the cardi. The body of the cardigan would not be a problem to pull out. I carefully picked up the stitches all the way around the fronts and back and then I was planning on cutting it off to unravel up to my circular needle holding the stitches. You can see the circular needle, above, holding the stitches along the back. Here's where it got trickier. I had a horizontally knit button and buttonhole bands. I decided to use a crochet steek across each of the front bands just below the picked up stitches. You can see that I picked up stitches on the front bands as well as the body of the cardigan. You can see the crochet steek on both sides directly below the needles. I cut the steeked stitches on the front bands. It was really exciting because at this point I still didn't know if my plan would work. I knew I could most likely fix up most any situation but I didn't know how difficult it would be to get the cardigan looking good again. 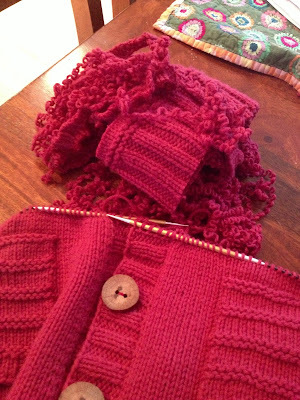 When I saw that the steeks were going to hold the front band stitches adequately in place I began cutting and unraveling the bottom section of the cardigan. I measured and I got rid of close to 6-inches of fabric! Here is the beautiful cardigan all set to finish up with the stitches neatly on the needles and with the nest of ripped out scraps sitting nearby. I still have this stack of leftovers. I should try to save as much of the yarn as possible at some point. It felt so good to make this improvement. I knew in the end it would be worth the effort. I added on the garter ridge to keep the theme of the sweater intact. 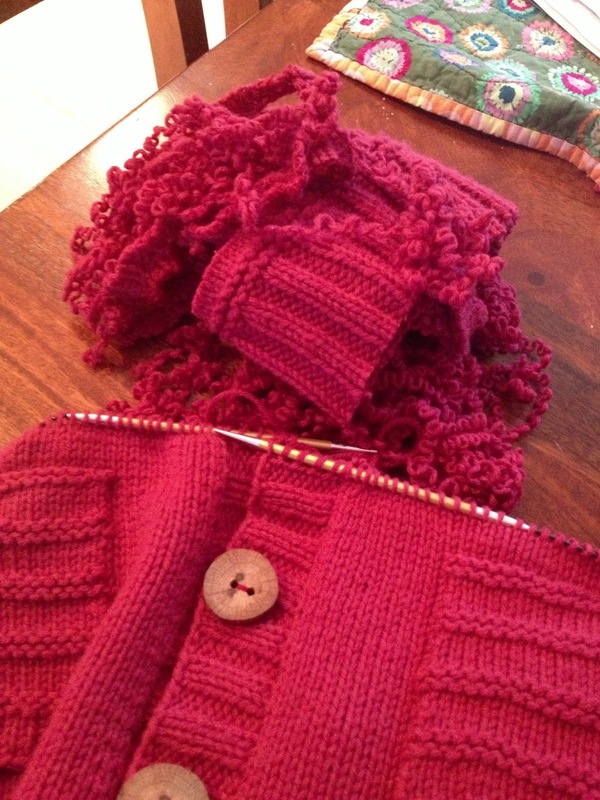 I then knit maybe 6 rows of rib and bound off at a relaxed tension. I stitched the crochet steeks down to the inside of the cardigan. I gave the new edging a good steam to set the stitches. You would never know the difference! It looks like a million bucks. Here is the underside of the bottom edge and front bands. You can see the tacked down steeks. I am so much happier with the length and the fit of my refreshed Belfast Hoodie. I have not taken it off since. The yarn and fabric and fit are simply perfect. It is much more flattering and wearable at this length for me. It feels like a new cardigan all over again! Removing 5 or so inches at the bottom has made all the difference in the world. 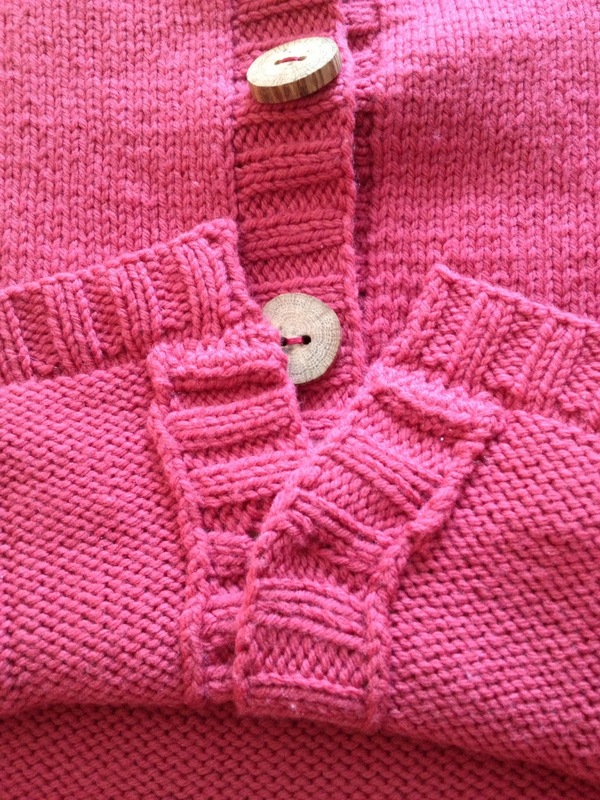 If you don't like a certain something about a garment you made, maybe you can change it to make your perfect cardigan or sweater come to life. I agree. Much, much better! What modifications - from the beginning - would you suggest for the rest of us who also want to add buttons all the way down the front? Susan you are so amazing!!! I do not know if I will ever be as good or adventurous as you, but I hope to be someday. Wow, that's some impressive altering! Congratulations, the finished product is really beautiful. Wow! You are so courageous!! This post is inspiring me to be fearless! Excellent! You are amazing. I love how you perservered and re-worked a favourite cardgian. It looks just right!! Very cute! The sweater is beautiful! I do like the shorter version! You are so much braver than I. I am quite tall and would need to add those five inches! Thaks for the information. Great lesson. I am in complete and utter AWE at your courageousness and your ability (which I would never doubt!). I don't think I even "get" everything you did to alter this beauty, but I am so impressed - it turned out amazing. You are truly an inspiration to all of us! Very clever and educational! I would never have been brave enough but now that I've seen how it's done, if I ever have a similar problem I might be willing to tackle it! What a job but the end result is gorgeous and loks so good on you at this length! Wow, very impressive. I got a little clammy at the cutting and steeks and all...phew. I just did the opposite with my husband's sweater! 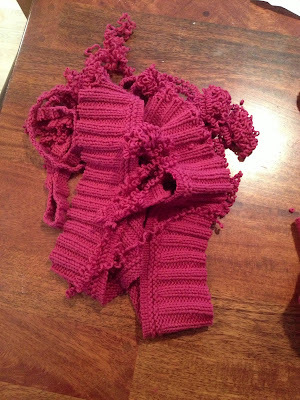 I had to add on four inches, which involved cutting, knitting, and grafting it back on. Your sweater looks great! 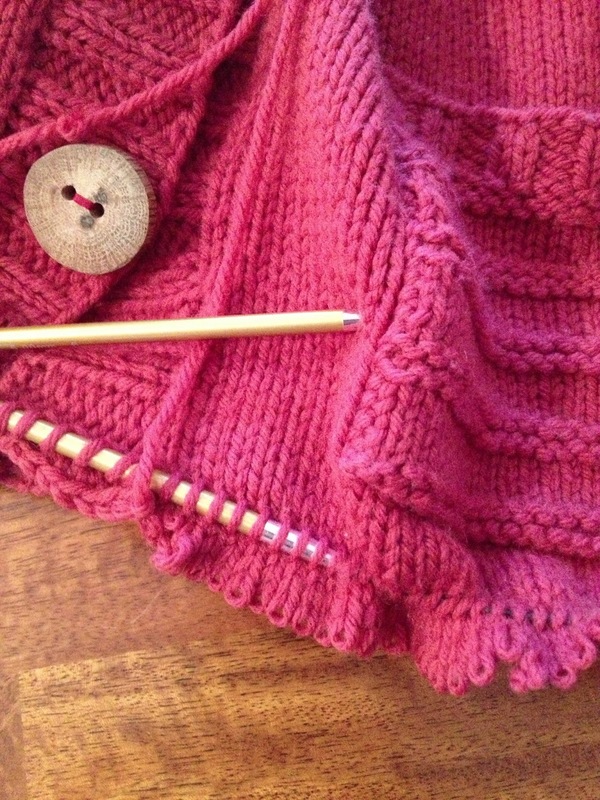 It's always worth going back and fixing mistakes, even after the sweater is finished. Wow! Such craziness!! The same sweater, both beautiful. I really appreciate this post! First off it's nice to hear that even knitting gurus make "mistakes" or have things that turn out less than perfect. Second, the detailed fixes give me confidence to go forward in fixing and modifying. Thanks! Susan, you absolutely amaze me! I take risks when sewing but am not quite so confident yet with my knitting. You give me so much to strive for in the future! So clever to steek the front bands!!! You never cease to amaze me!!! I learn so much from you. Thank you. I want to make this sweater too, are you planning to write up your modifications for us not as talented as you knitters? I won't be writing up these modifications any further than I discussed on this blog post. However if you are knitting this sweater and you know you might like it shorter just make it shorter from the start, then you won't have the issues later:) It will be easy! What I do is figure out where I want the buttons on the button band first, lay them out and measure, then make the buttonholes to match on the buttonhole band as I work. You continue to be my mentor! You are absolutely amazing and so talented. I want to be you in the weaving community!!! I love to knit, but find my passion is weaving. The problem is that it is not portable, so I continue to buy your books and try to be half as good as you!!! You give me courage to change the things i think would be better for me. Thank you! This is awesome Susan! It looks great on you. I also love how you used the picture of your sock drawers as your new header. Beautiful! What an awesome job you did on this cardigan. Really, both the original knitting and the redesign. 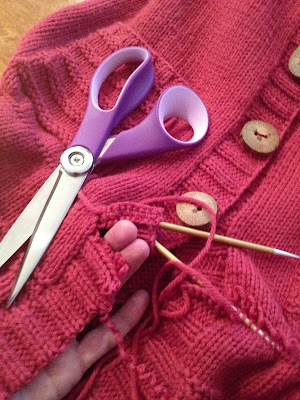 I'm not scared of dropping stitches to fix cables, etc., or even shortening sleeves. But I think I would have been petrified of tackling this project! It was much too large for me the first. Hubby helped my frog it, re-skein and recently re-cake it. It's not been a trouble-free journey. it has taken four tries to get the waist/bind off satisfactory. I love the color of your Belfast! It fits you beautifully.